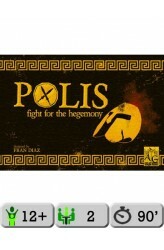 Polis: Fight for the Hegemony is a two-player civ-lite game set in the beginning of the conflict between the two major poleis of the 5th century B.C: Athens and the Delian League against Sparta and the Peloponnesian League. The winner will be the Empire with more population and prestige at the end of the game. With a growing empire, feeding your people is the main goal. Wheat was scarce in Greece, so both players must secure other goods supply and the route to five markets in order to trade them for wheat. Each territory may give you different amount of wood, metal, wine, olive oil, silver and some wheat; these two last ones are hard to get but precious. It’s up to you if you want to get more of only one good or less from several of them. Every turn you get goods from a territory yo..